Mt. Wudang is located in northwest Hubei and is a state-level scenic spot. It occupies 30 sq. km. There are 72 peaks with unique scenery. Tianzhu Peak is the summit, 1, 612 m above sea level. Mt. 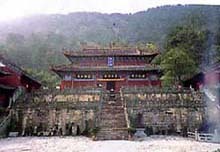 Wudang is a famous Taoist place and many well-known Taoists had practiced austerities here. Five-Dragon Temple was built at the Lingying Peak during the reign of Emperor Taizong of the Tang Dynasty, with more temples being built in the Song and Yuan dynasties. Large-scale construction was done with 300, 000 soldiers dispatched by Emperor Chengzu of the Ming Dynasty. Most of the existing 36 temples and palaces were Ming architecture. They are the largest supreme Taoist complex in China that have been reserved intact. 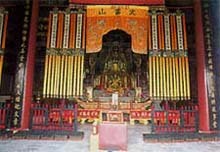 Various god statues, scriptures and musical instrument used in Taoist mass collected in the temples are of very high artistic value and are precious cultural relics.